Chicago's mayor Rahm Emanuel says the sudden move to drop charges against actor Jussie Smollett over a hoax attack has made a fool of the city. The state's attorney's office maintains Mr Smollett has not been exonerated, while Mr Smollett's lawyers say his record has been wiped clean. "They better get their stories straight because this is actually making a fool of all of us," the mayor told ABC News. Speaking on Good Morning America on Wednesday, Mr Emanuel pilloried the Empire actor, saying he "abused the city of Chicago". "You have the state's attorney's office saying he's not exonerated, he actually did commit this hoax. He's saying he's innocent and his words aren't true." Illinois prosecutor Joe Magats made the decision to drop charges against the TV actor on Tuesday in a move that blindsided police - but he maintains that Mr Smollett is guilty. "Our priority is violent crimes and the drivers of violence," Mr Magats told CBS News. "Jussie Smollett is neither one of those." He added that community service and a fine is a common outcome for such a case. When asked if those penalties were sufficient for Mr Smollett, he said: "I feel that it is." Tandra Simonton, a spokeswoman for the Cook County state's attorney, told NBC News that prosecutors "did not exonerate Mr Smollett", but offered an agreement available "to any defendant with similar circumstances". "The charges were dropped in return for Mr Smollett's agreement to do community service and forfeit his $10,000 bond to the City of Chicago. "Without the completion of these terms, the charges would not have been dropped." Police, however, have disagreed, with Supt Eddie Johnson saying if Mr Smollett "wanted to clear his name, the way to do that was in a court of law so that everyone could see the evidence". A Chicago police union on Tuesday renewed calls for a federal inquiry looking into what role the state's prosecutor Kimberly Foxx, who recused herself, played in the case. In a statement to NBC, the Fraternal Order of Police said they are "outraged...but not surprised". The union said Ms Foxx had "transformed the prosecutor's office to a political arm of the anti-police movement". What's this about a former Obama aide? 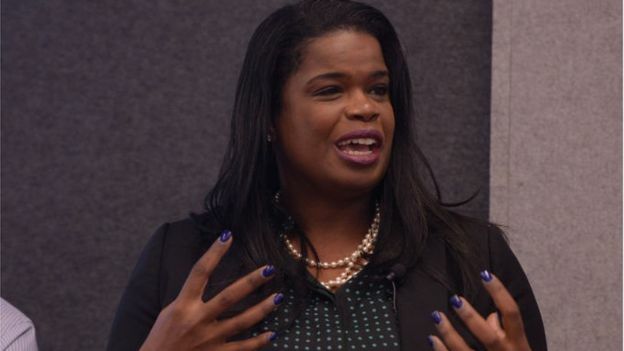 State's Attorney Ms Foxx recused herself from the Smollett case last month, citing a conflict of interest "based upon familiarity with potential witnesses in the case". According to local media, attorney Tina Tchen, former chief of staff to First Lady Michelle Obama, connected Ms Foxx with Mr Smollett's family in the days following the alleged attack. The Chicago Sun-Times reported earlier this month that Ms Tchen had texted Ms Foxx on 1 February that the actor's family had "concerns about the investigation". Ms Foxx later told the Sun-Times that those worries were regarding leaked information about the case from "police sources", and that the family felt the FBI would keep a "tighter lid on the information". She then contacted Ms Tchen and Mr Smollett's relative to inform them about her call with the superintendent, according to records viewed by the newspaper. "Spoke to the Superintendent Johnson," she wrote to Ms Tchen in an email. "I convinced him to reach out to FBI to ask that they take over the investigation. He is reaching out now and will get to me shortly." After Ms Foxx sent the relative a similar message, they replied: "OMG this would be a huge victory." Ms Foxx's office did not immediately return a request for comment from the BBC.